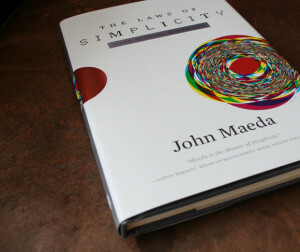 John Maeda’s The Laws of Simplicity is a short exploration of simplicity in design, business, and life. He presents ten laws and three keys to simplicity (below), accompanied by stories ranging from the usual suspects in design like Apple, Google, and Bang & Olufsen to experiences with zen gardens, smileys and progress bars. Law 1: REDUCE. The simplest way to achieve simplicity is through thoughtful reduction. Law 2: ORGANIZE. Organization makes a system of many appear fewer. Law 3: TIME. Savings in time feel like simplicity. Law 4: LEARN. Knowledge makes everything simpler. Law 5: DIFFERENCES. Simplicity and complexity need each other. Law 6: CONTEXT. What lies in the periphery of simplicity os definitely not peripheral. Law 7: EMOTION. More emotions are better than less. Law 8: TRUST. In simplicity we trust. Law 9: FAILURE. Some things can never be made simple. Law 10: THE ONE. Simplicity is about subtracting the obvious, and adding the meaningful. Key 1: AWAY. More appears like less simply by moving it far, far away. Key 2: OPEN. Openness simplifies complexity. Key 3: POWER. Use less, gain more.